David Putnam, archaeologist/climate scientist and University of Maine at Presque Isle faculty member, has traveled the world to investigate climate change. But for the past few years, his work has centered in countries like Bhutan, China and, most recently, Mongolia, where he and his son have been looking to mountain glaciers and ancient shorelines to better understand how Earth’s climate has operated over time. Putnam and his son, Dr. Aaron Putnam, Assistant Research Professor, Lamont-Doherty Earth Observatory, Columbia University, joined an international team of researchers in Mongolia last summer to conduct this work, and already have plans well underway to return to the country this coming summer to continue their efforts. The research team is composed of a large, international group of scientists led by Dr. George Denton of the University of Maine’s Climate Change Institute and Dr. Wallace Broecker, of the Lamont-Doherty Earth Observatory at Columbia University, both members of the U.S. National Academy of Science. The team’s work in the summer of 2014 focused on developing high resolution chronologies from mountain glaciers worldwide, using a new method called cosmogenic dating. According to Putnam, mountain glaciers serve as natural thermometers and respond faithfully to summer atmospheric air temperatures. When the snowline lowers, the glacier advances; when it raises, the glacier retreats; and when it is stable, the glacier builds moraines at its terminal snout. Cosmogenic dating is conducted on the quartz-bearing boulders that have been dug up by the glacier and deposited on these moraines. It turns out that when the quartz is exposed to the sky, it gets bombarded by cosmogenic rays, producing an isotope of Beryllium, 10Be, which accumulates predictably over time. Not only are scientists able to measure the amount of 10Be in a boulder to find out how long it has been sitting on the moraine, but based on the position of the dated moraine, scientists can also reconstruct the age of that snowline elevation. This provides an unprecedented chronological record of atmospheric temperature that can be compared to other proxy records, such as carbon dioxide concentrations in air bubbles found in ice cores from Antarctica and Greenland. To collect the 10Be samples, members of the team traveled to the northwest corner of Lake Khovsgol, about five miles south of the Siberian border, to explore the Horoo Gol moraines. There they found two major sets of moraines—one more than 100,000 years old that extended into the lake, and a second, larger moraine belt that was several miles inland and approximately 20,000 years old. Tracking the glacier recession, however, was not a possibility: the team would have had to work in close proximity to the Russian border, where there is a very real possibility of being shot or arrested by border guards from either nation. The next leg of their adventure took the team westward on a seven-day journey through sometimes roadless expanses of remote Mongolia. At Khyargas Nuur, a large playa lake, the team collected samples from the series of ancient shorelines reaching up to 140 meters above the modern lake level. In addition to the mountain glacier research, the Putnams focused their attention on water balance, as glaciers grow and shrink due to a combination of summer temperature and precipitation. Mongolia, like the western U.S., is home to mountain glacier systems that feed meltwater into closed basin, “playa” lakes, or lakes with no natural outlet stream and where all water is lost through evaporation (similar to the Great Salt Lake). Playa lakes have ancient shorelines that can be measured and dated, providing accurate records of how much water they contained and when. One other important stop for the group was at the valley of Kurgan and Khoton Lakes, which has two major moraine belts surrounding the bodies of water. Camping below a series of small bedrock mountains known as the Biluuts—which are a World Heritage Site because of the ancient petroglyphs chiseled into their bedrock—the team collected many samples from the Khoton Nuur Moraines. They also collected one from the outer, older moraine belt, and then chased the recession up-valley and up the petroglyph-covered slopes of one of the Biluuts. Some of the samples collected during this trip are currently being processed and Putnam hopes to get some preliminary dates back soon. The data he and others gathered on the trip, when added to similar data from the world’s other three hemispheres, provides researchers with a complete collection of high resolution chronologies from mountain glaciers worldwide. And that, explained Putnam, affords an “elegant test of the two [competing] theories” that dominate the debate over how the Earth’s climate operates. What does that mean for the future? 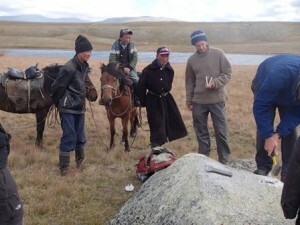 Putnam plans to dig deeper on his next trip to Mongolia.